Resource development is outpacing provincial efforts to protect the habitat of the threatened woodland caribou. That&apos;s the warning found in a report from the Canadian Parks and Wilderness Society being released today. In an embargoed copy obtained by CBC, the CPAWS report shows there&apos;s been a lot of resource development since 2012, when the federal government ordered the provinces to come up with a plan to conserve caribou habitat by 2017. The report points to increased natural gas development in British Columbia, new oil and gas leases in Alberta and a new mine in a Manitoba provincial park. "Unfortunately conservation isn&apos;t keeping up with development, so the habitat of the caribou continues to be very much at risk pretty much everywhere across the country," said Eric Hebert-Daly, the group&apos;s national executive director. 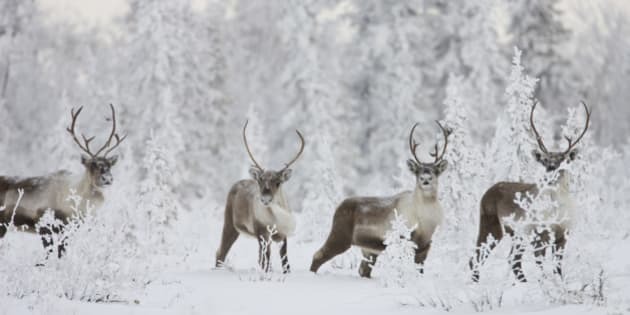 The annual status report on the caribou, which ranks the provinces and their plans for recovery strategies for the caribou, puts Alberta at the bottom of the list. Hebert-Daly says the caribou need about 65 per cent of the habitat to survive, and in some parts of Alberta their available land is very small and the size of the herd is shrinking, increasing the risk of extinction. "In some cases, they&apos;re well well below the threshold for a good chance of survival," he said. Duncan MacDonnell, of Alberta&apos;s environment and sustainable development department, said the province will release some of its recovery strategies in the next few months, beginning with the herd that is most at risk, the Little Smoky Herd. He told CBC News a multi-stakeholder group has been working on that strategy for a while. "So there&apos;s a lot of interests at the table. It&apos;s a very busy landscape, and it&apos;s the first one we&apos;re doing so you take a little more time in that first one to get it right," MacDonnell said. While there&apos;s been a big population boom in Alberta, he said, the province is committed to finding a balance between development and the environment. "There&apos;s a lot of users competing for a limited landscape here, and that includes the animals. And the challenge facing the government of Alberta is trying to balance all of these interests and at the same time you&apos;re trying to keep those animals on the landscape. It&apos;s not an easy challenge," MacDonnell said. - In Quebec, the work of the caribou recovery team was suspended in October this year and won&apos;t resume until next spring. As well, 50 jobs were cut from the department. - In Newfoundland and Labrador, the branch of the department responsible for monitoring the caribou was shut down this year, and most of the staff were laid off or retired. Federal Environment Minister Leona Aglukkaq has called a special meeting with the provinces to come up with better ways to save species at risk in general. Aglukkaq used the caribou as an example of animals that do not respect provincial boundaries. "I look at caribou that migrate between two, three provinces and a territory, but we&apos;re looking at a siloed approach. There&apos;s got to be better co-ordination of how we do this," Aglukkaq told CBC News recently. "It might force a lot of the governments that haven&apos;t been taking it seriously to finally come to the table and put plans on the table and start thinking this through," he said. The Federal Recovery Strategy, released in 2012 under the Species At Risk Act, outlined the critical need for conservation and restoration measures in vital caribou habitat across Canada, and required the provinces and territories to have recovery plans in place by 2017. Hebert-Daly says that work so far has proceeded at a "snail&apos;s pace," adding they may not all be done on time.